I love chocolate covered coffee beans, but more often than not they’re a bit disappointing and either use mediocre chocolate or beans that don’t have enough flavor to them. 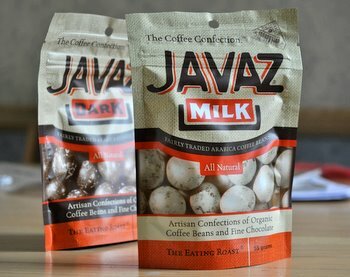 The packaging of Javaz, a brand of milk and dark chocolate covered coffee beans, really caught my attention with their promise of being “artisan confections of organic coffee beans and fine chocolate.” The candies are Arabica coffee beans enrobed in chocolate and finished with a very thin candy shell. The dark chocolate is not too sweet, with a good cocoa and berry notes to it, like a dark roast coffee. There is a good ratio of chocolate to coffee bean, and the chocolate compliments the crisp bean inside very well. 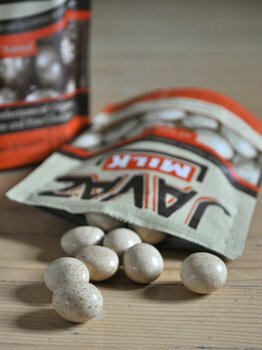 The milk chocolate version is much creamier than the dark chocolate Javaz, and melts easily on the tongue. It leaves behind a sweeter, creamier flavor that reminds me of a mocha latte rather than of black coffee. The shells are extremely crisp and thin – much thinner than the shell of, say, and M&M -and they shatter with a satisfying crunch when you bite into them. I’ll definitely pick these up again, going for the dark when I want more of a strong coffee flavor and the milk when I’m in the mood for something creamier. I found these at a local store (Cost Plus World Market) but it appears that they are also available online if you’re looking for a new way to get your chocolate covered coffee bean fix.